Aamir Khan starrer 'Dangal' is knowing no bounds. The sports drama has now collected Rs 2000 crore worldwide according to a Forbes report. The report stated that with minting Rs 2.5 crore in its 53rd day in China, 'Dangal' has become the first Indian movie in history to gross the 2k crore figure. Earlier the film had achieved the feat of being the fifth highest grossing non-Hollywood film in China. Aamir Khan who is currently busy in the filming of his upcoming movie 'Thugs of Hindostan' has not spoken anything about this great success but last month he was quoted saying to the IANS about Dangal’s roaring box-office figures in China- "It was unprecedented. We are pleasantly surprised." Just a couple of weeks ago, Chinese President Xi Jinping had praised about the movie to Prime Minister Narendra Modi. 'Dangal' became the highest grossing Hindi film ever in India after its release minting Rs 375 crore in India alone. This feat was later surpassed by 'Bahubali 2' which became the first Indian film to gross more than Rs 1000 crore worldwide. Now the fates have change and 'Dangal' stands at the coveted position of being the highest grossing Indian film ever globally. 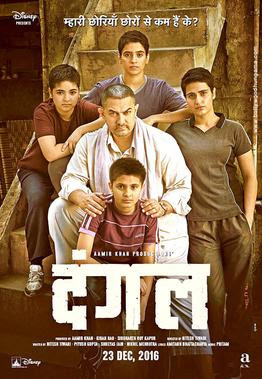 In China Aamir's film released on May 05 as 'Shuai Jiao Baba' that translates to Let’s Wrestle, Dad. The film chronicles the struggle of Mahavir Singh Phogat who leaves no stone unturned to teach wrestling to his daughters.